At the March meeting of Lodge of Lights No 148, the brethren were to see the final part of plans made to celebrate the lodge’s 250 years of existence, being a third degree demonstration following on from the first and second degrees already delivered over the past few months. Pictured from left to right, are: Danny Wheatley in period costume and David Harrison (WM). The demonstration was again delivered by the Sutton Coldfield Study Circle Demonstration Team, to perform in period costume, a typical third degree ceremony dating back to 1765, using the ritual of the year the lodge was founded. This was the concluding part of a very successful delivery of demonstrations of the first and second degrees. A candidate for the evening came along with the demonstration team and Daniel (Danny) Wheatley, the lodges latest master Mason, was invited to dress up in period costume and join in with the group in the ceremony. Danny was delighted to play a part in the re-enactment of the ceremony of the 1765 style. 53 members and guests attended the meeting to witness the event, including grand officer Stan Churm. The lodge was opened in the usual way by the WM David Harrison and the administration undertaken. This was followed by a ‘calling off’ by the JW Peter Range. David introduced the Sutton Coldfield Demonstration Team and their performance started. A quick introduction was provided by their WM to help put everything into context. The ancient brethren assembled and just as normal, well not quite as normal, but recognisable, the minutes of their last meeting were discussed and agreed. The lodge room was laid out into two separate parts, with a table at one end and a floor covering marked out on a sheet at the other. The main reason was because early lodges usually met in a single room and the dining area was in the same room as the lodge area. The lodge area probably would have been marked out with chalk or charcoal onto a wooden floor. It is noted in the minute book that the lodge was banned from one public house because the apprentice washed the floor with water and made such a mess! It would appear that our ancient brethren spent a lot of time ‘calling off’ and ‘calling on’, with a great deal of time spent on refreshment rather than on work! Indeed, whist the lodge was open much liquid refreshment was consumed. The performance which was light hearted, but with much realism, had many recognisable sections, even by modern Freemasons and was extremely enjoyable and good fun. Comments like ‘nothing changes’ and ‘that’s similar to what we do today’ and so on were heard. Picture left: The candidate taking his obligation. Picture right: The candidate being toasted afterwards. Following on from the demonstration David thanked the Sutton Coldfield Team for their excellent re-enactment. The lodge was then ‘called on’ and work continued. Following the meeting an excellent three course meal was served by the hall staff. A raffle was held and a total of £224 (including the charity plate), was allocated to the Sutton Coldfield Team to decide which Masonic charity they would like to nominate as the beneficiary. The team leader very kindly suggested that they would like to put the monies to the MCF 2021 Festival. 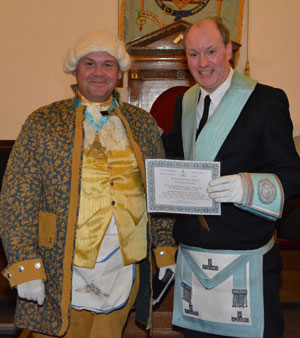 They commented that they had enjoyed the meeting and considered it an honour and privilege to perform a ceremony from 1765, to a lodge which was in existence at that time. David thanked the team for a most enjoyable demonstration and all the work they had put into it. He wished them a safe journey home and thanked everyone for their attendance. The Sutton Coldfield Demonstration Team with Danny (second from the left).